After an exhilarating yet exhausting three day safari in the Masai Mara, my travel buddy and I headed to the Giraffe Manor Hotel in the outskirts of Nairobi for lunch as we were invited to have lunch at this charming hotel which is normally only served to overnight guests. The boutique Giraffe Manor Hotel is set in a 1930’s manor house which shares the grounds with the Langata Giraffe Centre also known as the African Fund for Endangered Wildlife. The latter was founded in 1979 by the late Jock Leslie- Melvile and his wife Betty Leslie Melvile who wanted to create an educational institution and rescue the endangered Rothschild giraffes in Kenya at the same time. The manor house used to be the home of the Melviles and the centre still does what they envisaged it to do today. Rothschild giraffes are bred here till they’re old enough to survive alone in the wild and people can come here to learn more about this endangered species and in doing so helping the giraffe breeding program. The giraffes walk around the grounds freely so guests at the hotel are guaranteed to interact with these majestic animals, especially around meal times when they seem to be really keen to have a nosey around the house. This is exactly what happened during our meal. 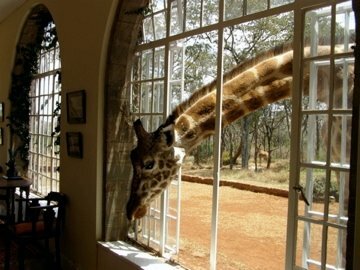 Lunch was served on the terrace and after only a couple of minutes the first giraffe popped by to say hello. It’s a bit surreal to have a giraffe hovering around your table begging for food. 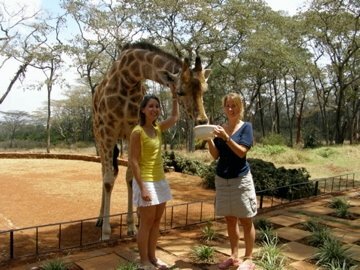 After we’d finished our lunch, we were given a bucket of pellets that the giraffe emptied in no time after which she stuck her head through the hotel window into the breakfast room to look for more. After dessert we were taken to the actual Giraffe Centre. From a raised platform visitors can pet and feed the giraffes with the same pellets just like we did at the hotel, but the platform allows you to be at eye level with them. And it makes it easier to do what I did; Stick one of the pellets in your mouth and see what happens. Well, what happened was that my entire face got slobbered and her breath wasn’t exactly minty fresh. Not what you’d call the perfect kiss after a lunch date. It was very surreal to see them stick their head through the windows.